My firstborn gave me the title of Cybermom when I began nagging him through emails while he was in college. The rest of the family also complained that I nagged. I can’t help it; it is part of me. But what with the boys having flown the coop, the poor Lord and Master (L&M) was left to bear the brunt of all that nagging. Then the younger one came home on a holiday and had a brainwave. He started a blog for me so that I could go online and nag the world at large! When he asked me to give a name to the blog, I didn’t have to think twice – and so Cyber Nag was born. On my blog, I nag about things that affect me in some way and consequently I make others react with a post on it. Sometimes the Cyber Nag will take you back in time; at others you might just be living through the event; you will think, cry and you will laugh with me too. Welcome to my space, read my posts and do give me your comments and criticisms so that I can come back and nag you some more! Congratulations!! Wonderful work of creativity and writing. Keep up the good work of enriching the readers with cultural nuances. That’s a wonderful page to introduce yourself. I came over from Beloo’s post and glad I did 🙂 I will see you around. Good that your younger one brought you in front of us, else we won’t have been able to get nagged so beautifully. No, I don’t know your younger one. Hahahaha! Yes, it’s creating confusions. Lola, your sense of humor is hilarious. Actually, Twitter suggested me your handle & from there I found your Blog. So, let’s break the mystery & disclose his name, what say? Since I am certified nag, how about you reading the post, Falling in love with books and the comment of a certain Biker. Check out his Twitter handle and voila! 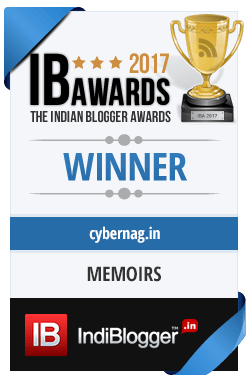 😮 You’re the mum of IndiBlogger’s Royal Enfielder? Yes, you did. And like a good student, I successfully found it out. Your ‘about me’ page has the most comments I have ever seen on any blog. Not only are they a testimony to the love everyone has for you but also, lets face it, because people want to learn how to nag effectively. The Indian education system being deplorably inadequate in this area, one finds no teachers to teach this very alluring art. I do believe you have create a unique niche for yourself Zephyr! I am impressed out of my socks! I am VERY pleased I sought your blog today. This is going to be a fun place for me, I know. Now for some posts! Great to have made the connect, as they would say, Dagny 🙂 I have a new blog to read regularly in yours too. (I might not be posting comments regularly though) As for my nagging skills, the long suffering family, especially the L&M would testify to its efficacy 😀 I do hope you like the posts enough to keep coming back. I agree about WP comments. Accept a new fan on the huge list which u own ! Thank you Meera. I have already done that tag for my second blogaversary. I will update it and post the link in your blog, is that ok? That’s great!! Unless your choices in the various categories have changed in the meantime. I like what I read here, Zephyr and will learn more to nag my family in a proper way…! Very rarely, I advice people. I keep on nagging about only one thing…my husband’s walking in the morning! I too learn emailing…using computer, after my sons left abroad for their studies! I find it easier to advice/nag (oh, god, I too am a nagger, I think!) in emails than in person! Will come back to read some more interesting topics! Thanks for coming by my blog. I have not yet gone into your postings here. But glancing the comments here, I understand that your following is pretty good. I hope to know about the “art of nagging”, I mean in a constructive way. Oh yes, I do — I mean the art of nagging 🙂 For instance, I will keep nagging you till you put in an email subscription option on your blog. 🙂 Would you call it constructive or not? Hope to learn the art of nagging from you, so that I can live in peace thereafter! Sure! Point taken 🙂 Thanks fir the visit! Did you come for the Dove Indiblogger meet, by any chance? You have a wonderful blog here that gives you a hearty laugh, the humorous way to look at things. You are a great writer and i am blog rolling you. Nice to know you enjoy my blog posts. do keep visiting. It was nice meeting you for a short time in the meet. Interesting blog you got here. Yeah, I act like an authority on everything. Goody! I now have another one to nag 😀 Psst, you know something? Everyone likes to be nagged. Ask the L&M and the brats! It was nice meeting you at the bloggers meet . Nice meeting you too. Saw your blog. Luscious food indeed! Hey thanks and welcome here, Sakshi. I have already visited your blog and even left a comment! Ann, no, I am not on any social network. My kids and friends help promote my posts! Nice Blog – This one is super cool 🙂 and I guess u love it too, going by the frequency of your posts 🙂 Great going 🙂 would love to read more.. Thank you so much Tikuli! All this is so new to me. I have to learn the ropes fast i guess. You have opened my eyes to the eternal truth O wise one! Where have you been all these days? will you take me as your disciple? Ha, ha.. you are most welcome! I hear that you are a damn good writer. Where can I read your stuff?